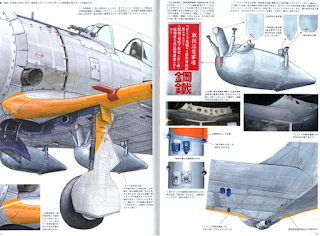 Many of this blog’s readers still consider the Maru Mechanic (MM) publications on Japanese aircraft types as invaluable, though sadly it’s been over thirty years since we’ve seen a new one. They featured remarkable color paintings of cockpits and interior details that have inspired modelers worldwide and which were illustrated by (I believe) Takani Yoshiyuki, who also painted much of the early box art for Tamiya, Fujimi, and others as well as Tamiya’s iconic armor box art. He is probably best known in Japan these days for his imaginative Macross art. The MM cockpit paintings were truly remarkable interpolations, however, as their sources were so meager: the few surviving factory and manual drawings; scarce period photos from both Japanese and American (TAIC) sources; in rare cases, museum aircraft - sometimes with little original equipment; a handful of surviving relics; and probably conversations with Japanese veterans still alive and sharp of memory at the time these were created. The results of this detective work came together wonderfully, like a jigsaw puzzle finally finished on the tabletop. I’ve often wished the series could have continued, and we could have seen more of such art. So two recent Model Art Special publications published in November 2015 and May of this year came as a very pleasant surprise. Entitled Japanese Army and Navy Airplanes Illustrated (Book 1 and Book 2), they boast a wealth of vivid color paintings of Japanese aircraft details that, though not by the same artist, bear much the same style and contain that same level of detail and thoroughness. They are researched and illustrated by the late Sato Shigeo, a IJNAF veteran, and his son Sato Kunihiko. These large format softbound books feature 163 and 147 pages respectively and in Japan, sell for 2500 yen (about £18 or US$24 - Ed.). They are dense in detail and every page is in color. As I understand it much or most of the material has already appeared as a semi-regular feature in monthly issues of the Japanese Model Art magazine. 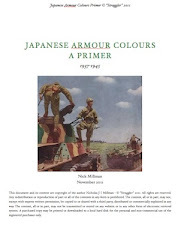 As a collection, their approach is generally twofold: to embellish detail areas that have been covered more generally in previous Japanese and Western publications; or to present partial material on rarer types as well as a few peripheral subjects often neglected, like maintenance equipment, drop tanks, and fuel trucks. In both cases the fascination, especially for modelers, is to discover previously unknown or unseen details. 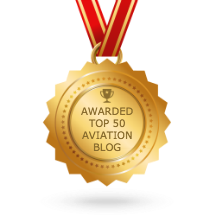 It also means no single aircraft is covered comprehensively (or even close to such) and because of the “scattershooting” approach of these books, they may not appeal to everyone. 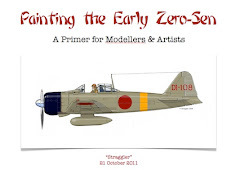 Each volume also features information markings and stencil details, and the paintings that focus on certain areas of aircraft highlight many group markings and painting variations, thought that is not the main focus. Both books also include superbly built and photographed models that dovetail with featured aircraft – a 1/72 Zuiun (Paul) on a catapult, a 1/48 Hasegawa F1M2 “Pete,” and a 1/32 Hasegawa Ki-44 Shoki. 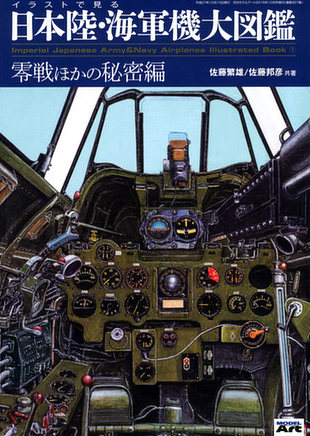 The first volume features large sections on Zero, Seiran, Toryu, Saiun, G5N Shinzan / G8N Renzan turrets and landing gear among several esoteric sets of images showing late-model Zero headrest and head armor variations, gunsights from every conceivable angle, and tail wheel centering systems and their corresponding cockpit controls and readouts, drawings. 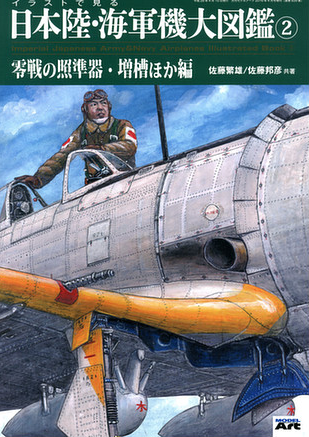 The second book has a great deal of useful information on Nakajima’s Ki-44 and a wonderful section on prewar Japanese biplanes and triplanes: Mistubishi 1MF, Nakajima A2N, Mitsubishi B1M and B1M2. 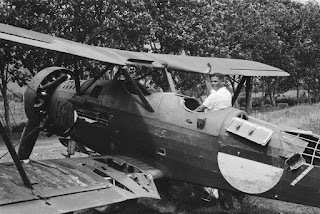 And for those of you with the ancient Marusan Mitsubishi 1MT Triplane (Type 10) Torpedo Bomber in the closet, who might have thought ‘if only there was any documentation on it,’ hey hey: your excuse is obsolete. There are twelve pages on it that include the floatplane version for the really ambitious (John Haas could do it!) There are great illustrations of different torpedo sights and equipment, including their unusual mountings from above on Mavis and Emily, and a plethora of aircrew uniform details. I’ve left out a lot of things that appear in each book. Some might understandably dismiss the material as mere arcana, and those with only a casual interest will probably opt for more focused titles. 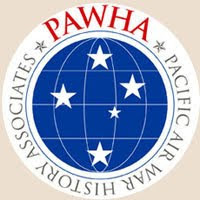 But as Aviation of Japan has demonstrated over a period of many years, the art of interpolation is still required in piecing together clearer and more accurate accounts of the development, operations, colors, and markings, and details of these airplanes, too many of which have no survivor. Arcana are essential puzzle pieces! If you join me in embracing their material as ‘new,’ useful, and interesting you’ll want these books. There is no English text in these volumes, save the title on the front cover. One regrettable result is the artists/researchers are not identified for non-Japanese readers, which seems a shame. Even though they are obviously aimed at a Japanese market, enthusiasts in many countries will value them, and it would have been nice to see them credited on the title page in several languages. Anyway, if they sound interesting, tarry not, as sometimes Model Art Specials disappear pretty quickly. I got mine through Hobby Link Japan. With special thanks to Mark for this review. Readers should note that Volume 1 is already showing as 'Out of Stock' at HLJ but Volume 2 is still available. 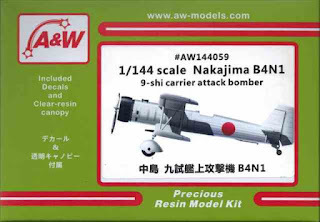 Back in July last year and courtesy of Ken Glass we featured Dr Frank Mitchell's superb 1/32nd scale scratchbuilt model of the Nakajima B4N1 9-shi carrier attack bomber prototype, here. Now Anigrand Craftswork, a Hong Kong based manufacturer of exquisite resin kits featuring rare and exotic types in various scales, are set to release a 1/72nd scale kit (above) of this unusually configured aircraft. Price at this stage is unknown but the bold or well-heeled can pre-order it from Hannants with a 10% discount. The kit appears to be all resin with some cockpit detail and a simple decal sheet for the Hinomaru. 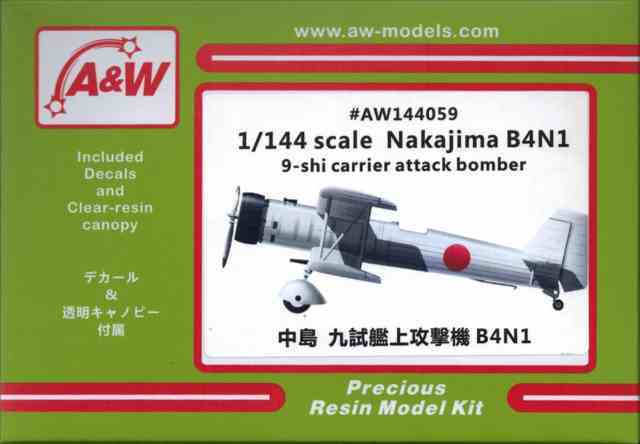 It would make a most interesting comparison companion to the forthcoming Airfix Nakajima B5N1. There was also a 1/144th scale kit of the type released in September 2015 by A&W Models in Japan priced at approximately £30 ($40) but details and current availability are uncertain. A grateful hat tip to Jacob Terlouw for alerting Aviation of Japan to some interesting photos in the National Archives of the Netherlands. 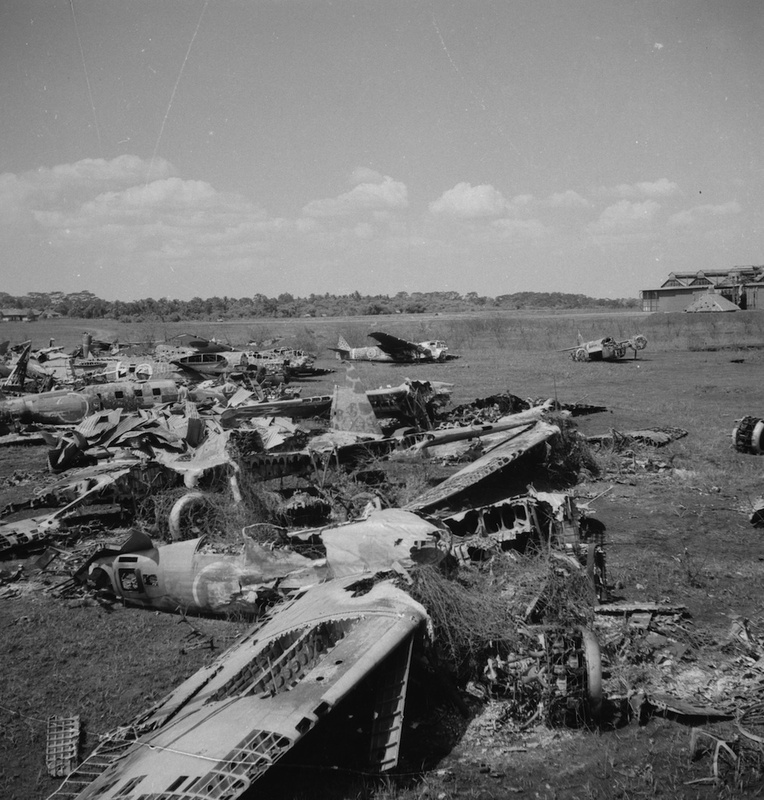 The first shows abandoned Japanese aircraft wreckage photographed at Semarang in Java in August 1947. It reveals in the background the remains of at least three Bristol Blenheims in Japanese Army markings and reticulated camouflage. Two appear to be Blenheim IV types whilst the central hulk might just be a Blenheim Mk 1. The Blenheim IV on the right (shown enlarged above) appears to have been converted into a passenger aircraft with the addition of four fuselage side windows and it retains its engines. 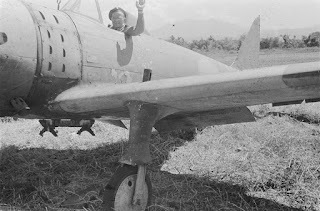 According to F. Djoko Poerwoko in 'My Home My Base, Perjalanan Sejarah Pangkalan Udara Iswahjudi 1939-2000' (Lanud Iswahjudi 2001, p.49-66) a Blenheim IV had been re-fitted with Japanese Nakajima Sakai engines. 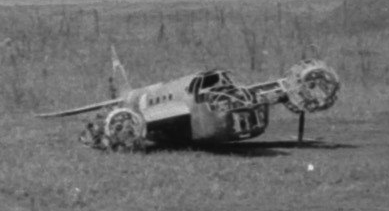 After a brief 15 minute test flight at Maospati on 13 November 1946 this aircraft crashed and was a total write-off but the pilot Suhanda and his five passengers were unharmed. According to Wiweko Soepono in 'Dari Blitar ke Kelas Dunia', (Jakarta 2002, p.64-134) the Blenheim was modified to carry passengers but was too nose heavy so three bags of sand were placed in the tail end of the fuselage. The aircraft flew three circuits over Madiun but then crashed when attempting to land. Another view of the same wreckage (above) reveals an interesting tail marking on a Ki-54 of what appears to be a stylised '5' or 'S' superimposed on a horizontal stripe. 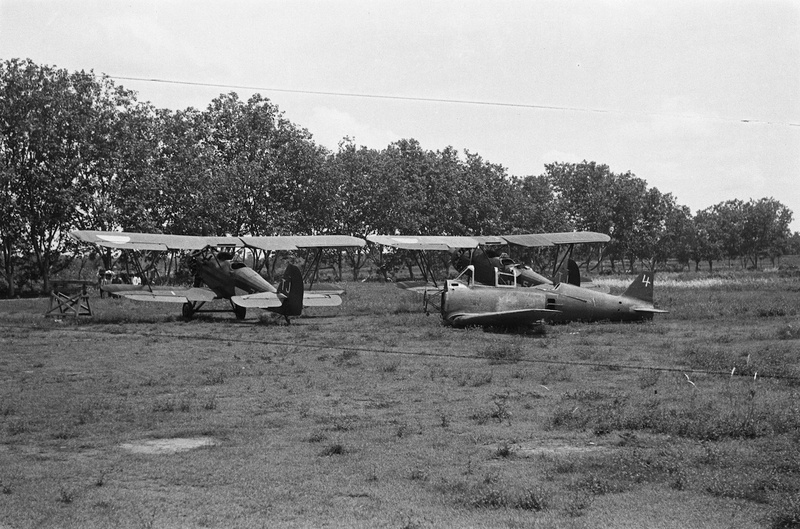 Semarang was within 9th Air Division's sphere of operations as part of 3rd Air Army. The 9th's Headquarters Flight (Shireibu Hikohan) marking is reported to be the white Chinese character 'Shô' (翔 - to fly or soar) set on a white bordered Hinomaru symbol. Also under 3rd Air Army's command was 5th Air Division coveringBurma, Thailand and Indo-China. The tail symbol used by the 5th's HQ flight from October 1943 was a highly stylised representation of the Japanese character for '5' (五) appearing a little like an old-fashioned sand timer. But perhaps the marking changed again? The transport Blenheim seems to have a similar marking. Two good clear close up photographs of a Ki-79 show useful details like the bomb rack, (presumably on a special attack aircraft), aerial mast, telescopic sight mounting, the eliptical cooling slots, the way the slotted undercarriage shaft extends above the wing with oleo compression and drooped flaps. 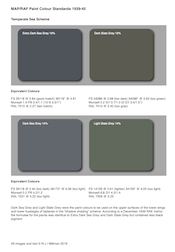 Paint colours are conjectural but probably severely sun bleached with evidence of over painting. 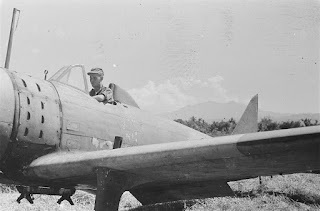 A photograph of two Yokosuka K5Y1 'Curen' trainers in Indonesian markings reveals the interesting detail that the AURI insignia appears on the port upper wing only. As there is no indication of overpainting of any Hinomaru on the starboard upper wing it seems probable that they had been completelt re-painted. 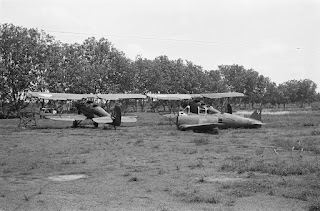 The two aircraft appear to have been photographed at Maguwo (now Adisucipto Airport) as their 'TJ' tail codes and fuselage numbers '54' and '72' (?) are recorded in other photographs and documents (Bakti TNI Angkatan Udara 1946-2003, TNI-AU, Jakarta 2003, p.11, 16, 20-42). A total of 75 K5Y1 were left in Indonesia of which 70 were seized by AURI and from 20-32 became operational. 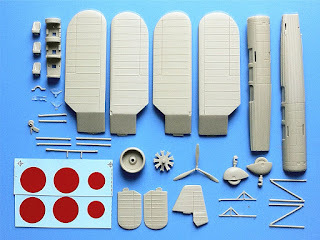 Rising Decals have recently released another batch of interesting resin accessory sets for Japanese Navy and Army aircraft featuring specialist underwing air-to-air ordinance. A brilliant feature is that as always the sets are self contained and include relevant decals for one or more subjects together with colour instructions. 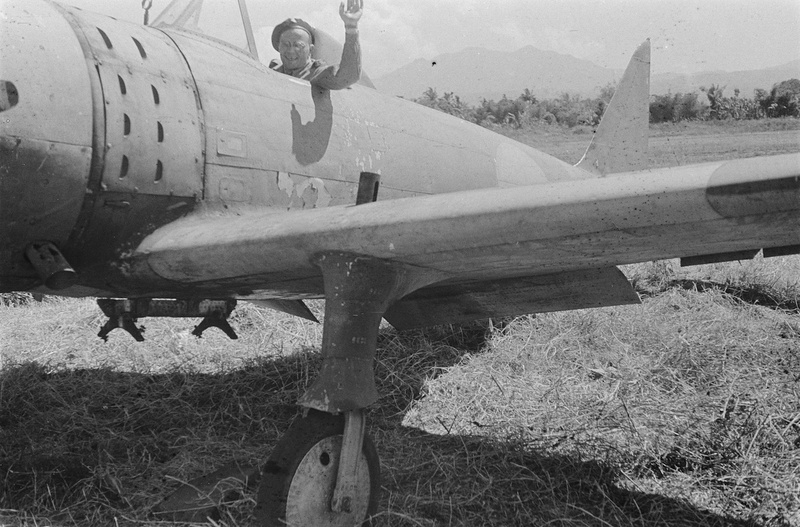 Set RD Acr-025 (shown above) contains ten Type 99 No.3 Mk.3 Mod.1 incendiary bombs and racks for a Nakajima-built A6M2 '61-180' of the 261st Ku at the Aslito airstrip, Saipan in June 1944 in sombre dark green over grey finish. The bombs and racks are separately moulded and the decal sheet includes the yellow tail code, data plate and small '2-3' stencil and a full set of Hinomaru with painted out white borders on upper wing and fuselage. This is a welcome set because the Type 99 had distinctive spiral auxiliary fins which are quite difficult to improvise. The Type 99 was a 30kg (66lb) bomb with nose and tail fuzing, a cast picric acid explosive filling and 198 phosphorous filled steel pellets intended for use against aircraft in the air and on the ground. The spiral fins were designed to accelerate the bomb's rate of rotation to 1,000rpm in order for the tail fuze to function. The subject aircraft carried five bombs under each wing and their position is clearly shown in the instructions. 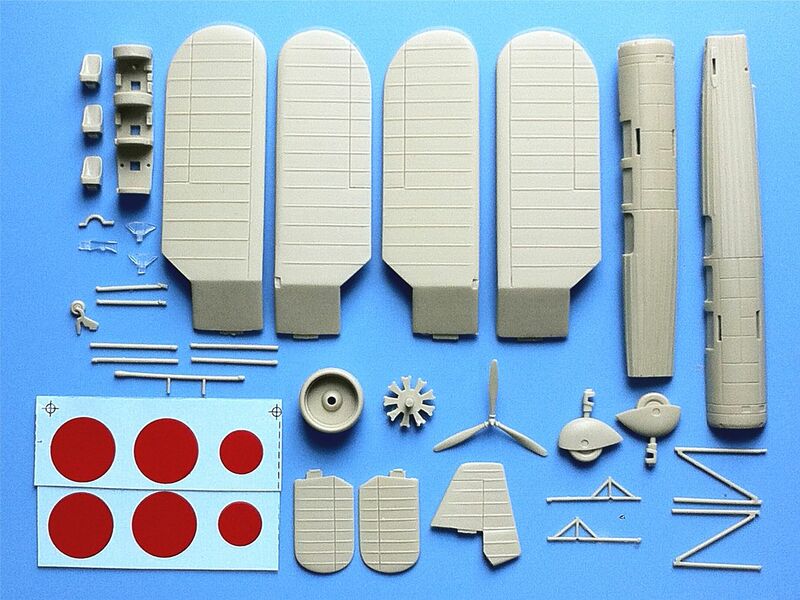 This is a useful, innovative set that will dress up an A6M2 model very nicely. Set RD Acr-026 contains just two Type 99 No.3 Mk.3 Mod.1 incendiary bombs and racks but decals for three different subject aircraft from the 381st Ku at the airstrip on Jefman Island in May 1944. Jefman is a small island at the north-west tip of New Guinea between Sorong and Waiwo. All three aircraft are Nakajima-built A6M2 with tactical markings of grey painted tail fins and wing tips. '81-1142' has a red horizontal tail stripe, '81-1183' a fuselage Houkoku legend for 'Seram No.1' and '81-1146' a white horizontal fin stripe and white forward cowling. The decal sheet contains a set of white bordered Hinomaru and data plate stencil for one aircraft, with white tail codes, tail/fin stripes and Houkoku legend for the options. Another very welcome set that will inspire the building and painting of a very different looking Zero. Set RD Acr-027 contains two Type 3 No.6 Mk.27 Mod.1 rocket bombs and racks with decals for two J2M3 Raiden interceptors of the 302nd Ku at Atsugi airbase, Japan in 1945. Decals include the Hinomaru for one aircraft, white tail codes for 'YoD-1148' and 'YoD-1140' with a yellow fuselage band for the former which also has colourful yellow trim on the tail fin, cowling and cowling flaps. This type of rocket bomb was developed to overcome the difficulty of dropping the Type 99 bomb to explode close enough to a moving aircraft formation. It was first designed in January 1944 but not adopted for operational use until February 1945 after extensive testing at the Hiratsuka and First Technical Arsenals and Kashima experimental bombing range. The 60kg (132lb) bomb contained 10kg of propellant and the bursting nose cone was filled with 140 iron pellets embedded in 4 kg of white phosphorous. After firing it reached a velocity of 270 m/sec and on exploding the dispersion arc of the pellets was 60°, functioning similarly to an artillery fired shrapnel shell. It was not designed to hit an individual aircraft but to explode within a bomber formation. This is another very interesting set to use to make a Raiden model a little bit different. Set RD Acr-028 contains four Type 3 No.1 Mk.28 Mod.1 rocket bombs and racks for two Nakajima-built A6M5 fighters of the 302nd Ku at Atsugi airbase, Japan, in 1945. The first, 'YoD-1132', is an A6M5a and the second, 'YoD-131' is an A6M5c. Both carry two rocket bombs under each wing. The decals include Hinomaru sufficient for one model, yellow tail codes and undercarriage numbers for both and the yellow victory mark (?) on the tail fin of 1132. The Mk.28 bombs were smaller versions of the Mk.27, being 7.65kg (16.8lb) in weight with a 0.6kg nose charge and 2kg of propellant accelerating the bomb to 400 m/sec. This set complements the previous set very nicely and together would make an interesting display representing the IJN's air defence of Japan against the B-29 bombing campaign. Set RD Acr-031 turns to the Army and provides two Ta-Dan cluster bomb containers for a Ki-44 of the 1st Yasen Hoju Hikotai at Singapore in 1944. 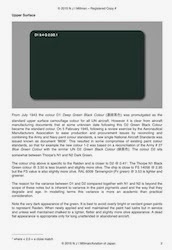 This aircraft is speculatively attributed to Capt Ryotaro Jobo and is depicted in the late-war olive drab scheme, although shown as dark green on the instructions. Decals are included for the Hinomaru, white senchi hiyoshiki war front band and the unit tail markings with individual aircraft number. The cluster bomb container was made of corrugated steel sheet in three sections and according to the US ordinance manual TM 9-1985-5 was painted black. This type contained 30 Type 2 40mm bombs of 0.33kg weight and could also be fitted to the Ki-61, Ki-84, Ki-100 and Ki-46, the latter pioneering the use of this type of ordinance against the B-29. Each bomb contained the Japanese Army Mk.2 'Tanoyaku' explosive charge consisting of 50% TNT and 50% RDX. When the container was released from the rack the arming wire was withdrawn allowing the container bands to fall away. The three sections of the container then separated allowing the individual bombs to fall free, arming themselves in the process (inside the container they were interlocked to secure the arming vanes). A very nice set for modelling an unusually armed Shoki from a very interesting unit. Set RD Acr-032 two Ta-Dan cluster bomb containers for a colourful Ki-46-III interceptor of Dokuritsu Hiko No.83 Chutai at Ashiya, Japan, in August 1945. This set contains the larger type of Ta-Dan cluster bomb container holding 76 Type 2 bombs and again the TM describes the container as being painted black. Decals consist of the Hinomaru, striking unit red, yellow and white tail markings and white bordered yellow fuselage bands. The white Homeland Defence 'bandages' will need to be painted on. Again this aircraft is in the late-war olive drab colour although shown as a dark green. The 83rd independent air squadron was originally intended as the reconnaissance element of the 12th Air Division formed from the 19th Air Brigade on 17 July 1944 under Maj Gen Furuya, but as bombing raids increased two-thirds of the unit's aircraft were re-assigned to the Ta-Dan interceptor role. The 12th Air Division was formally assigned to the General Defence Command but operated under Western Army Command and the other units within the Division were the 4th, 47th 59th and 71st Hiko Sentai. The 16th Air Brigade (51st and 52nd Hiko Sentai) and 246th Hiko Sentai were also attached to the Division. The 246th gave birth to the 82nd independent air squadron, designated in February 1945 with a specialist high altitude interception role and also equipped with Ki-46-III fighters. The relationship between the 82nd and 83rd, if any, is unknown. The Ki-46-III interceptor had a long formal designation - 百 hyaku (100) 式 shiki (type) 三 san (3) 型 gata (model) 司令部 shireibu (headquarters) 偵察機 teisatsu-ki (reconnaissance aircraft) 改造 kaizô (remodeled or modified) 防空 bôkû (air defence) 戦闘機 sentô-ki (fighter). 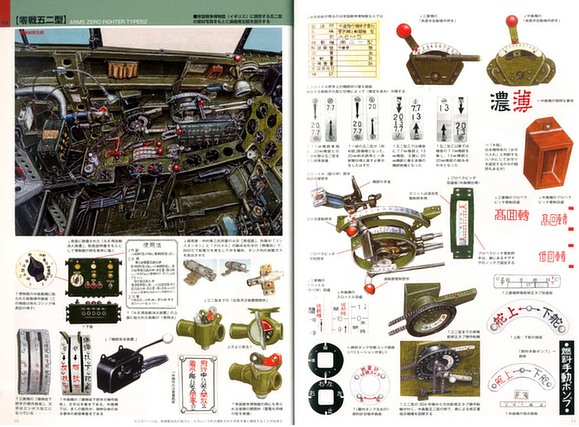 Various abbreviated designations were used to describe the different armament configurations but the variant depicted by Rising was typically referred to simply as san gata otsu ( "3 model otsu" - Ki-46-III kai otsu or Ki-46-III kai b). 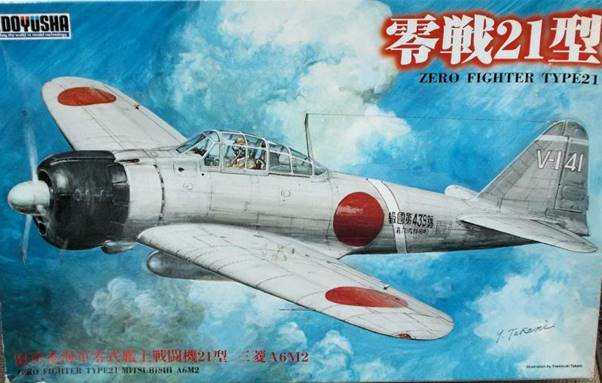 20 aircraft of this type, without 37mm oblique armament, were manufactured by Mitsubishi and 55 modified from Ki-46-III in Tachikawa Army Air Arsenal. 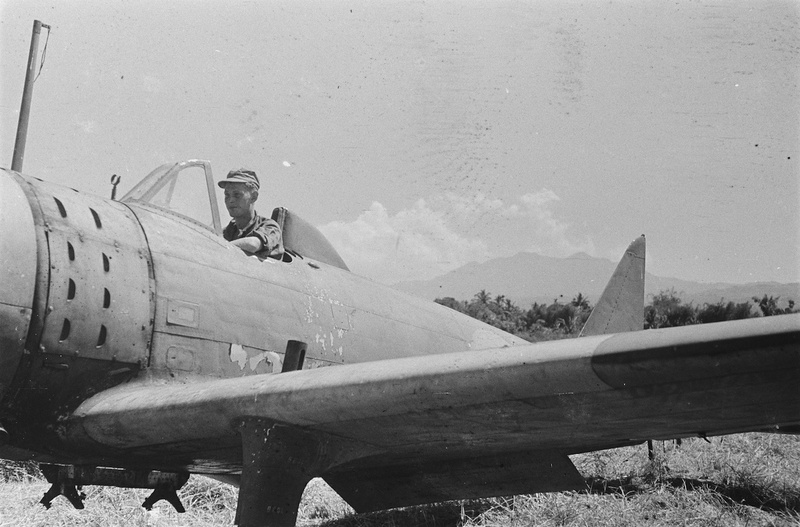 The Ta-Dan containers were also carried and used by unarmed Ki-46 variants in the Japan-based reconnaissance units. All the accessory parts in these sets are crisply moulded in grey resin but will need care in removing from their sprues. 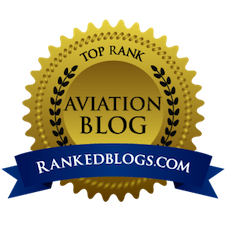 They are all very welcome additions to Rising's continuing indulgence of Japanese aircraft enthusiasts and highly recommended. With special thanks to Mirek of Rising Decals for the review samples.